“The Safer Northern Territory through Correctional Interventions, also known as the Hamburger report, labeled the Northern Territory’s imprisonment rates as the worst in Australia and some of the worst in the world. The report revealed 85 per cent of adult prisoners are Indigenous, and 95 per cent of juvenile detainees are Indigenous, with both heavily recidivist. It made 172 recommendations to the Northern Territory government, a number of which were flagged as “urgent”. 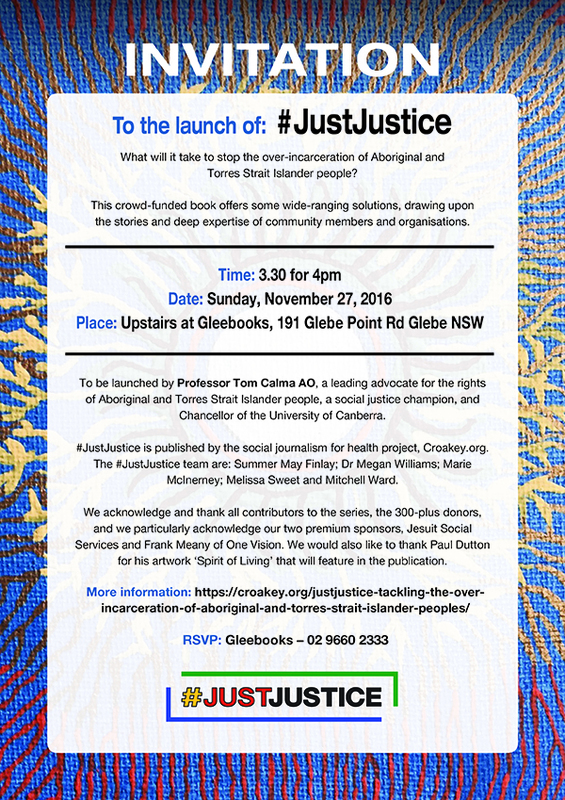 ” NACCHO readers are invited to attend the launch in Sydney on November 27 of #JustJustice, a book profiling solutions to the over-incarceration of Aboriginal and Torres Strait Islander people. Professor Tom Calma AO, a social justice champion and Chancellor of the University of Canberra, will launch the book, which will also be freely available as an e-book via Croakey.org. 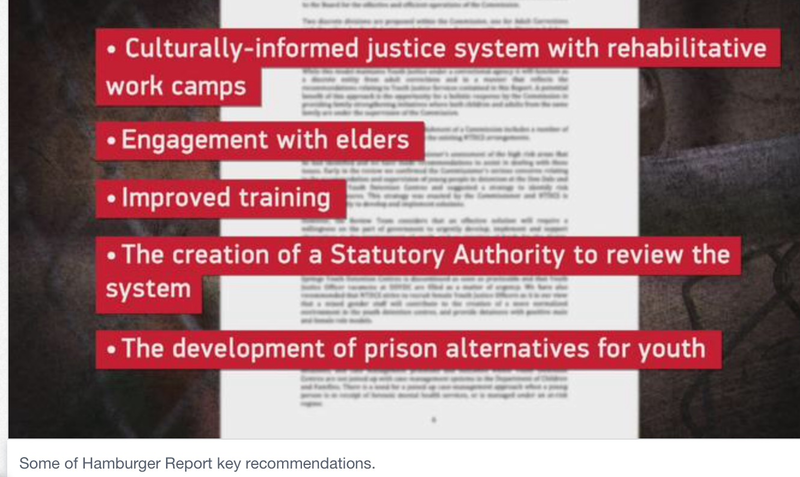 Aboriginal NGO’s in the Northern Territory have welcomed a report that recommended a complete overhaul of the Territory Corrections system to address a “devastating” crisis unfolding for Indigenous Australians. While the Territory’s population makes up just one per cent of Australia, it accounts for five per cent of prisoners – most of whom are Indigenous. “It’s something that the legal services and a lot of the NGO’s have been saying to the government for many, many years – that this needs to happen and it just fell on deaf years. “To have a report that comes out and highlights this and has it in their key recommendations is just such a positive move,” Priscilla Collins says. “All of it will take us a while, but there’s a number of recommendations that can happen quite quickly,” she adds. The report has echoed previous calls to close Darwin’s troubled Don Dale Youth Detention Centre. “Look that’s been a concern we’ve been raising for a number of years,” Ms Collins said. “Don Dale was never suitable for youth, and then they put them into an adult prison that wasn’t suitable for adults, but is all of a sudden suitable for youth… and you wonder why we have problems when you’re putting people into inhumane facilities,” Ms Collins said. 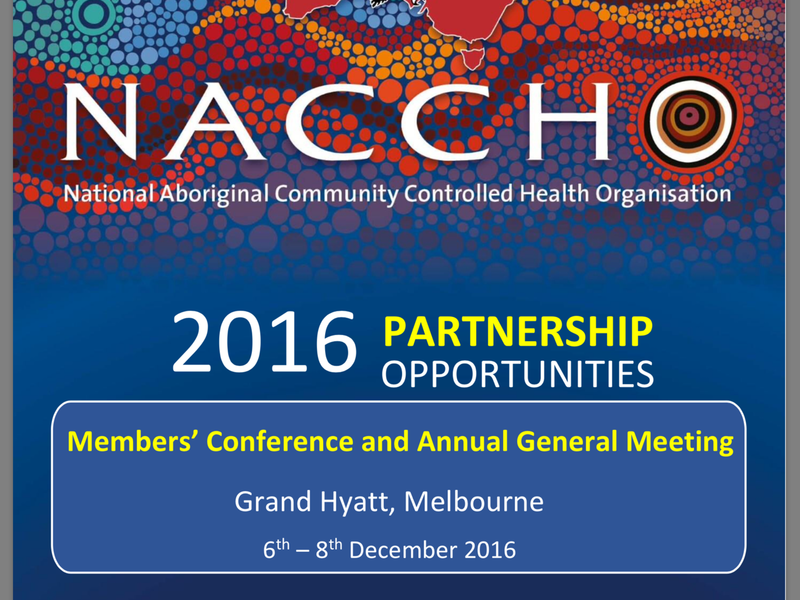 But the Attorney-General, Natasha Fyles, said there won’t be a new facility until after the Royal Commission. “A new youth detention facility would be a significant infrastructure spend,” she said. -Don Dale Youth Detention Centre is “unsuitable accommodation for young people in detention”. -Alice Springs Youth Detention Centre is also “unsuitable accommodation for young people in detention”. -Darwin’s half-billion-dollar prison commissioned less than a decade ago is “unfit for purpose”. -Alice Springs adult prison is operating “well over-capacity”. It also found many low risk prisoners are being classified as ‘high risk’, housed in isolation, and restricted from rehabilitative programs. “That’s been an ongoing issue and that also comes down to the training of staff. We welcome intensive training of the staff, and should also look at whether there’s failures in the policies and procedures,” Ms Collins said. The report recommended the classification of prisoners be managed externally. The Hamburger Report was commissioned by the former Country Liberals government after boys were gassed and shackled at the Don Dale Youth Detention Centre, but former Chief Minister Adam Giles refused to release its findings. The new Labor government has accepted the findings and released an executive summary of the report, but it too has refused to make the whole document public, citing privacy issues. The government says “some of the findings have been addressed”, and it will work to support collaborative Indigenous policy reforms over the next 12 months. The full report will be tabled at the Royal Commission into Youth Detention. The NT government last week introduced legislation to ban the use of restraint chairs on youths and has already moved youth justice out of the corrections and into the families department. The NT Corrections Department annual report for 2015-16 has also been released this week, revealing the adult prison population has hit a 15-year high. It found the Northern Territory’s Aboriginal and Torres Strait Islander prison populations are 30 per cent higher than the national average.